Everyone and their uncle has an opinion on where LeBron James should sign this summer. Nobody, not even LeBron’s inner circle, really knows what the potentially greatest superstar free agent in NBA history will ultimately decide. But if there’s one thing we do know about LeBron, it’s that the one thing he cares about the most is his legacy in the pantheon of basketball greats. He doesn’t care about the money – he has plenty of it and everyone’s offering the same max contract regardless. He doesn’t care about suiting up with his USA Basketball buddies and having a good time. No, all he cares about is winning. NBA greatness is measured in championship rings, and thus far LeBron’s fingers are completely bare. The next time he is a free agent will be in 5-6 years and LeBron will be past his prime with his legacy all but cemented. This is the biggest decision of his life and the greatest “changing of the guards” in recent NBA history. He can’t risk screwing this up, so let’s put the options on the table and see where LeBron should go. The start of LeBron’s NBA career almost had a storybook feel to it. The freakish athlete who grew up in Akron, Ohio gets drafted first overall by his hometown team and is immediately anointed as the savior of the franchise. He took the Cavs from basketball purgatory to heaven, making Cleveland one of the most powerful franchises in professional sports. His presence in the city alone generates $200 million for local businesses and $100 million in franchise value. One little problem though – he couldn’t win there. He was the sole reason the Cavs were perennial contenders for an NBA championship, but he received little help in bringing the impoverished city its share of sports glory. Byron Scott, the newly appointed coach of the Cavs, seems confident that LeBron will return to his hometown to play with likes of an under-sized Mo Williams and a 36-year old Zydrunas Ilgauskas. “I think at the end of the day, he’s going to make the right decision, and he’ll be here in Cleveland for the rest of his career,” said Scott. “His legacy of winning championships in his hometown will be like nothing he’s seen in his life. Scott’s right. If LeBron can win in Cleveland, his legend will be complete. But is the supporting cast good enough to help him? Reports of a super summit between LeBron, Dwayne Wade, and Chris Bosh are intriguing. The NBA has never seen such a star-studded trio assembled in one place, and even with 9 minimum-salary players filling up the roster this team could still do some serious damage for years to come. However, no matter what LeBron accomplishes in Miami, this team will forever be Wade’s after the Heat’s championship run in 05-06. Wade will get the credit and LeBron and Bosh will become the trustworthy sidekicks, which is not a role either superstar is eager to play. There’s a lot to like about the Bulls, particularly that the team already employers superstar-in-waiting PG Derrick Rose and a very competent center in Joakim Noah. The Bulls also recently hired former Celtics assistant Tom Thibadeu to be their new head coach. Chicago could trade Luol Deng to add a player like Chris Bosh to the mix, building a team that could certainly be competitive for many years. Most pundits believe that LeBron will land up in Chicago and from a pure performance standpoint it’s probably his best option. However, the problem in Chicago, as in Miami, is that LeBron will have to play under the shadow of another great – Michael Jordan. Comparisons to “The Great One” would haunt LeBron for the duration of his Bulls career, and it is almost inconceivable that King James would be able to match Jordan’s 6 championships and 5 MVP’s (not to mention various other NBA records). The best LeBron could hope for is to become the second greatest player who ever lived (an idea that cannot possibly appeal to the perfectionist player). This is an exciting team to watch with an impending move to Brooklyn and billionaire owner Mikhail Prokhorov signing the paychecks. But with only Devin Harris and Brook Lopez as capable starters, this team is more than just a superstar away from being legitimate contenders for an NBA championship. Sorry LeBron, you can still listen to Jay-Z on your iPod. The thought of basketball’s most recognizable athlete playing for basketball’s most psychotic owner (Donald Sterling) may seem laughable at first, but it’s not as crazy as it sounds. The Clippers have a solid foundation for a team with C Chris Kaman, PG Baron Davis, SG Eric Gordon, and 2009 #1 overall draft pick Blake Griffin. Gordon and Griffin are two of the league’s up-and-coming young players, and Davis is still an enormously talented player that just lacks motivation. Adding LeBron to that mix would instantly make the Clippers into one of the top teams in the Western Conference. The Clippers may very well represent LeBron’s best chance to win right now. The other perk of course is that once Kobe starts to decline, Los Angeles will become LeBron’s city. He will help steal the spotlight from Kobe and the Lakers and make the Clippers relevant for the first time in decades (which is no small feat). It’s seemingly just as likely that LeBron could blow out his ACL and never unleash his full potential, but the rewards of this scenario working out are through the roof. Think I’m crazy? I’m not the only one. Raptors F Hedo Turkoglu recently went on Turkish radio and offered his thoughts on LeBron’s final destination. As each of these 6 teams takes its turn attempting to woo LeBron James, we patiently await his decision to see how he will transform the basketball universe. Winning may be his primary motive, but it can’t be the only one. He cares about building the LBJ brand into a phenomenon unlike anything we’ve seen since perhaps the days of Michael Jordan. He wants little kids in far away countries growing up idolizing him. 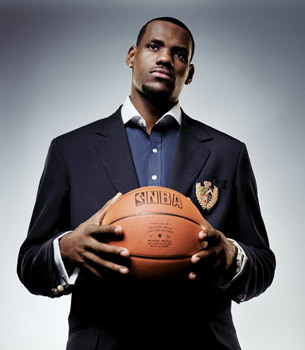 He wants to be the global icon that transcends the traditional boundaries of professional sports. But which city offers him the greatest potential to accomplish all this and more? LeBron, the ball is in your court. This entry was posted in Image Management and tagged Baron Davis, Blake Griffin, Brook Lopez, Bulls, Cavaliers, Chris Bosh, Chris Kaman, Clippers, Danilo Gallinari, Derrick Rose, Devin Harris, Dwayne Wade, Eddy Curry, Eric Gordon, Heat, Joakim Noah, Knicks, Kobe Bryant, LeBron James, Michael Jordan, Mo Williams, Nets, Zydrunas Ilgauskas. Bookmark the permalink. “I want to win. That’s my only thing, my only concern. I’ve always prided myself — it’s all about winning for me, and I think the Cavs are committed to doing that.